← What’s the Probability That Quadratic Will Factor? A problem from the May, 2012 issue of Mathematics Teacher by Jennifer Kaplan and Samuel Otten outlines a Max/Min problem from calculus which presents a scenario accessible to Algebra 1 and Pre-Algebra students. In the problem, a dog chases a ball thrown from the beach into the ocean, as shown in the picture. 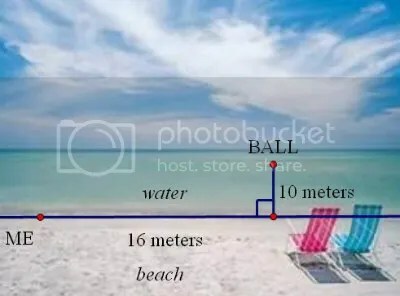 The challenge is to minimize the amount of time it will take the dog to travel from “me” to the “ball”, if he can run 4 meters per second on the beach, and travel 1 meter per second in the water. In the past few months, I have been looking for interesting problems to try with different levels of classes, and have made observations about how students approach non-routine problems. Today, I worked with an 8th grade Honors Algebra 1 class. It was a nice day, so we gave kids the chance to move outside, work in groups, and take 40 minutes to work on their ideas. 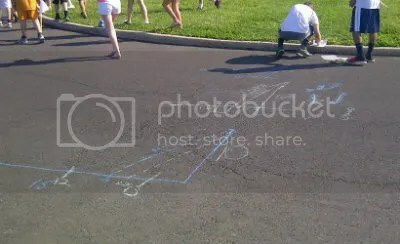 While some groups preferred to work with pencil and paper, others took immediately to the chalk we provided to begin sketching their ideas. Should I worry that so few students can apply the algebra they have learned? How can I coax groups to utilize some algebra, without being overly helpful? Should math teachers always feel compelled to demonstrate the “right way”? Is a non-algebraic solution less valid than an algebraic one? The traditional math teacher in me can’t wait to jump in and walk students through “my” way to solve it. But the facilitator in me was thrilled and impressed by the rich discussions taking place today. It’s hard to let go of old ways of doing things. Next week, students will produce 60-second videos where they will present their solutions. Looking forward to the variety of arguments we will certainly see. Also hoping to work on this problem with our non-honors and academic students. This entry was posted in Algebra, Middle School. Bookmark the permalink.